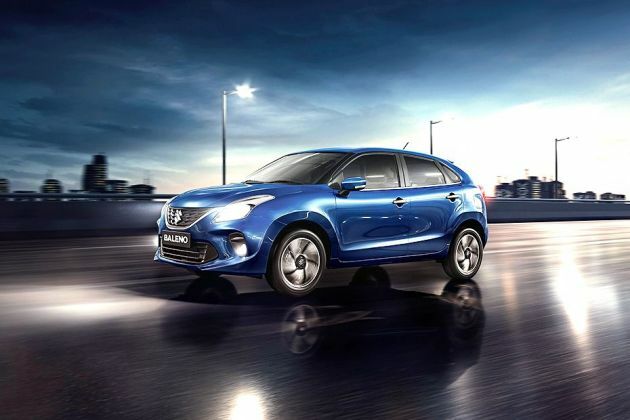 In this newly launched model lineup, Maruti Baleno 1.3 Delta is a mid range diesel trim. It comes with a 1248cc oil burner that is paired with a 5-speed manual transmission gear box. It is highly fuel efficient and ensures reduced emissions. The Maruti Baleno is offered with a proficient suspension system, which makes the drive smooth and comfortable as well. Talking about exteriors, it has a striking front facade that is highlighted by the chrome accentuated radiator grille. Its sides have ORVMs with side turn indicators and a set of steel wheels. Meanwhile, the rear end includes styling elements like tail lamps, spoiler and a body colored bumper. Coming to its interiors, there is a smooth dashboard integrated with a few sophisticated equipments. Those attributes which add to the comfort levels include power windows, air conditioner, remote keyless entry and a few more. As far as safety is concerned, it is packed with some vital aspects like rear defogger, dual front airbags, reverse parking sensors and dual horn that keeps the passengers safe while on journey. Find out what other variants of Maruti Baleno offer in terms of comfort and safety features. The automaker has given its outsides an excellent design that can lure any buyer at the first glance itself. To describe its side profile, there are pronounced wheel arches equipped with a set of 15 inch steel wheels. These rims get full wheel caps and further covered with tubeless tyres of size 185/65 R15. Also, it has body colored door handles and ORVMs integrated with side turn blinkers. Its rear end has tail lamps, and a stylish boot lid with company's emblem engraved on it. The windscreen includes defogger, and a wiper along with washing function. Meanwhile, the remarkable elements in its front facade include a bold radiator grille that is accentuated with chrome. Trendy headlamps on either sides of the grille further adds to its appearance. It also has features such as windshield with a couple of wipers, and a bumper with an airdam. The cabin is spacious and looks quite decent in a black color scheme. The metallic accentuation on door handles and parking brake tip further gives it a rich appeal. The seats inside are very well cushioned and covered with fabric upholstery. These further come integrated with headrests that can be adjustable. Meanwhile, the dashboard comes equipped with a few advanced aspects. These include a center console fitted with an AC unit, and an instrument cluster that gives out various notifications. Also it includes a glove box compartment, air vents and a steering wheel as well. Besides these, it comes with a boot space of 339 litres that can be further increased by folding the rear seat. Under the hood, it has a 1.3-litre diesel motor, whose total displacement capacity is 1248cc. It comes with four cylinders that are further integrated with 16 valves. This is incorporated with a common rail fuel injection system and paired with a five speed manual transmission gear box. Based on a double overhead camshaft valve configuration, this mill can generate 74bhp power at 4000rpm. At the same time, it delivers torque of 190Nm at 2000rpm. The fuel economy on city roads is about 22.59 Kmpl, while it goes up to nearly 27.39 Kmpl when driven on the highways. On the other hand, it consumes approximately 16 seconds to break the 100 Kmph speed mark and attains a top speed between 155 to 160 Kmph. Good stability is assured by the suspension system, which makes the drive free from jerks on uneven roads also. It has a McPherson strut assembled on its front axle and the rear one gets a torsion beam. In terms of braking, the front wheels are fitted with robust discs, whereas the rear ones have drum brakes. The availability of ABS with EBD further boosts this mechanism. When it is about handling, the electric power assisted steering column gives precise response and simplifies maneuverability. The Maruti Baleno bestowed with several attributes that help in adding to the comfort levels of its passengers. There is an automatic air conditioning unit available, which creates a pleasant ambiance inside. This trim has all four power windows that have auto up/down function on the driver's side. For in-car entertainment, it has an audio unit with a CD, MP3 player and a radio tuner along with four speakers. This system supports Bluetooth connectivity, USB port and auxiliary input options as well. It also has electrically foldable ORVMs and accessory sockets. Besides all these, the list also includes remote keyless entry, 60:40 split foldable rear seat, assist grips, steering mounted with audio controls and a few more functions that add to their convenience. This mid range variant is loaded with vital elements like TECT body, anti lock braking system electronic brake force distribution, dual horn and anti-theft security system. In addition to these, it also includes seat belts with pretensioners and force limiters at front, driver seat belt reminder, reverse parking sensors, defogger and dual front airbags that adds to the security quotient. 1. Mileage on highways is rather satisfying. 2. Reliable braking and suspension mechanisms. 1. A few more comfort features could have been added. 2. Engine noise can be further reduced.